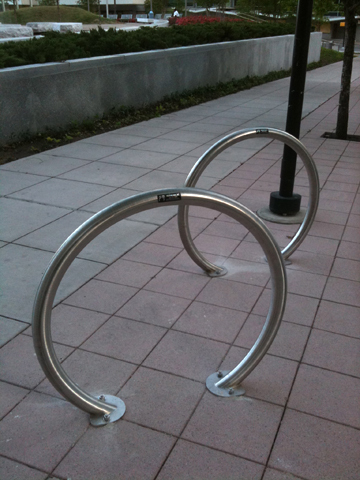 Yesterday we noticed a series of new stainless steel bicycle racks surrounding Main Street Garden. The new horseshoe rack is one of the approved styles for the district and follows recommendations from the Downtown Dallas 360 Plan. Main Street Garden — a popular destination for cyclists — was never outfitted with bicycle racks when it opened in 2009. 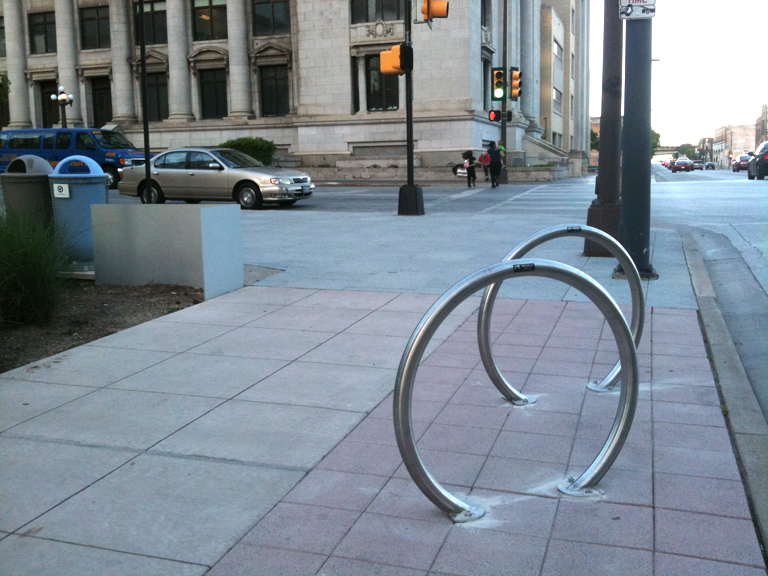 The new racks are positioned near park entrances at St. Paul Street, Commerce Street and Main Street; each can comfortably hold 2 bicycles. Throughout downtown Dallas new bicycle racks following the same shape will eventually replace older yellow U-shaped racks. At Main Street Garden the simple circular shape unintentionally references the old Gold Ring Garage; the area once reserved for hundreds of vehicles is now a destination for residents, visitors and cyclists. 3 Responses to "Cycle Parking at Main Street Garden"
Thanks for the explanation I was curious if these were just for Main Street Gardens or if the city was planning to install these all over the Main Street District. It seems like the city is finally getting into the details that truly will make downtown Dallas urban. Lets hope they are quick to adopt many of the other detail small projects in the Downtown 360 plan. Good looking out! I love these racks, they are so much more pleasing to the eye. As well as cheaper I am sure. Could Dallas be starting to make that transition to a bike friendly city? Slowly and not so surely…. Two and a half years later (Dec 2013) they installed three of them in front of the Wilson Building (Main and Ervay).